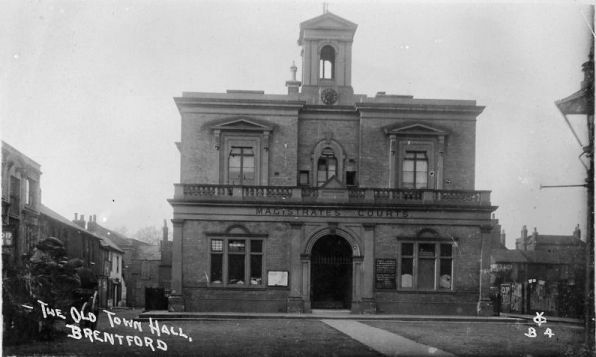 Howard Webb sent in this Young & Co postcard image showing Brentford Town Hall, Market Place. I have adjusted the image, which was originally sepia. It is a quiet scene apart from activity on the left, where a cart laden with barrels and sacks is being unloaded or loaded. The Magistrates Court has notices about an Election and a 'By Order' notice headed 'County Council of Middlesex'. An area of what at first glance is a grafitti covered wall to the right is in fact a range of advertisement posters, including one for 'Camp Coffee'. Walford Manor is near Shrewsbury, so why S Bugbee was carrying a postcard of Brentford who knows. The 1911 census shows Frederic Hughes, master tailor, at 66 Belle Vue Road, Shrewsbury. His customer, S Bugbee, could be Samuel Bugbee, age 38 who was working as a coachman for the Eyton household at Yeaton House, Ellesmere, Shropshire in 1911. Or (less likely?) the 34 year old bricklayer Samuel Bugbee in Hendon, or the 52 year old gardeners labourer Samuel Bugbee in Mitcham Surrey? Read more about the history of Brentford Market or check for other images of the Town Hall and Market Place.